St. Charles DUI Lawyer Donald J. Ramsell of Ramsell & Associates, LLC announces the launch of his 2016 legal publication, “Illinois DUI Law and Practice Guidebook”. “The intent of this book is to help provide Illinois DUI attorneys access to relevant cases, updates to the law, procedures, and evidence related to impaired driving to aid them in building the best defense for their clients,” says Ramsell. 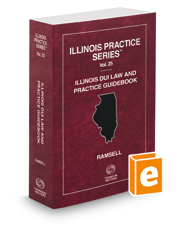 The DuPage County DUI law firm of Ramsell & Associates, LLC announces the release of the 2016 book entitled: “Illinois DUI Law and Practice Guidebook”, authored by Founding Attorney Donald J. Ramsell. Within the book, Ramsell provides insight on preparation and presentation techniques for DUI cases in Illinois. He also evaluates the most recent opinions and caselaw regarding Illinois DUI laws. Topics covered within the publication include: discussions on the science and procedures behind blood alcohol testing, drug tests, and sobriety tests. Furthermore, the book offers practice tips and suggestions to lawyers, and contains motions, filings, and forms that are helpful to DUI practitioners in Illinois. “The intent of this book is to help provide Illinois DUI attorneys access to relevant cases, updates to the law, procedures, and evidence related to impaired driving to aid them in building the best defense for their clients,” says Attorney Donald J. Ramsell. “Illinois DUI Law and Practice Guidebook, 2016 Edition” is available for purchase online through Thomson-West. St. Charles DUI Lawyer Donald J. Ramsell is the founder and managing partner of Ramsell & Associates, LLC. In addition to his most recent book, Ramsell has authored over 30 publications related to Illinois DUI law. Throughout his career as a criminal defense attorney, Ramsell has defended over 10,000 DUI cases. He is Board Certified in DUI Defense and is a Sustaining Member of the National College for DUI Defense. Ramsell is a past president of the DuPage County Bar Association and DuPage County Criminal Defense Lawyers Association. He currently serves as an assembly member of the Illinois State Bar Association, and is a member of the association’s Traffic Laws and Courts Section. Ramsell has been named a 2016 Illinois Super Lawyer, which marks his tenth recognition. He is also rated as a “Top DUI/DWI Lawyer” on AVVO based on exceptional client feedback and peer endorsements. The law firm of Ramsell & Associates, LLC has offices located in St. Charles, Wheaton, Naperville, and Rolling Meadows. Since 1986, the renowned DuPage County law firm has successfully handled cases related to DUI’s, drug violations, misdemeanors, felonies, juvenile offenses, traffic violations, and other various criminal defense matters. Ramsell & Associates, LLC has been featured on local and national media outlets including: Oprah, 20/20, NBC, CBS, CNN, FOX, the New York Times, Washington Post, and numerous radio shows. If you are seeking unparalled legal representation for your criminal law matter contact Ramsell & Associates, LLC today at 1-800-DIAL-DUI or visit http://www.dupage-dui-attorney.com to schedule a free case evaluation.